From tough MUR targets to piles of prescriptions, pharmacists have plenty of reasons to be stressed. And it's not a problem that looks set to go away anytime soon. 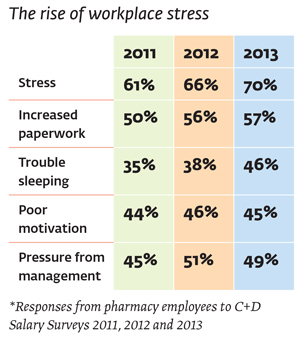 Seven in 10 pharmacy employees now suffer from workplace stress, according to the C+D Salary Survey 2013 – a four percentage point rise on the previous year. While stress is inevitably harmful, it's your reaction to it that can make or break your career. Meet Kate, a stressed-out pharmacist who has been in the job for more than 20 years. She works full time at a high-street pharmacy and juggles her work commitments with raising two young children and nursing her sick mother. She loved her job just after she graduated but, in recent years, she's found it increasingly difficult to keep on top of rising dispensing demands. She often stays late to write up controlled drugs entries or label repeat prescriptions. Even when she gets home, it's hard to switch off. Like 46 per cent of pharmacy employees who responded to the Salary Survey, she has trouble sleeping because of pressures at work. Kate feels like she's drowning, but doesn't know where to turn. She now counts herself as part of the 37 per cent of pharmacy employees who are considering leaving the profession. So what options does Kate have? Despite feeling increasingly stressed at work, Kate decides it's best to keep her worries to herself. She hopes things will settle down on their own, but the stress is already taking its toll on other areas of her life. Like one in 10 pharmacy employees, Kate is drinking more than usual at home to cope with the pressure. She is also one of the 43 per cent of pharmacy employees who worry that stress is affecting the service they give patients. She is starting to make an increasing number of dispensing errors or near misses, as well as giving poorer advice and MURs. What Kate doesn't realise is that this is just the tip of the iceberg. Kate feels her life is spiralling out of control and she becomes depressed. She's not alone: a quarter of pharmacy employees suffer from depression, according to the Salary Survey. In an attempt to cope, she starts to fake illness to give herself more time off work. "We see increasing numbers of employers citing absence due to stress as one of the most significant concerns they are dealing with," reports Susan Thomas, a senior associate in law firm Charles Russell's employment team. Ms Thomas advises employers to keep up "regular, supportive contact" with employees who are absent. "Offering suitable rehabilitation programmes prevents them from quickly becoming disengaged and anxious about a return to work, which exacerbates the problem and creates a vicious circle," she says. It's a problem shared by some respondents to the Salary Survey. "Two years ago I had to [leave] work for five weeks for work-related stress," reports one pharmacist. "My GP wanted me to be off longer, but I felt I had to go back." Kate considers speaking to a colleague about stress, but worries that her manager will find out and that she will lose her job as a result. Kate doesn't know that, under the Equality Act 2010, employers have a duty to make reasonable adjustments if an employee is deemed disabled, which can include a mental impairment that affects their work. Expecting stress to disappear on its own is the wrong course of action, warns Diane Leicester-Hallam, charity manager at Pharmacist Support. "The longer problems are left, the worse things can get," she says. "Unfortunately, by the time some people get in touch with us, their problems have escalated to a point where they can find themselves undergoing disciplinary proceedings or the General Pharmaceutical Council (GPhC) may have become involved." Andrea James, senior associate at law firm Shoosmiths, advises pharmacists who feel they may be reaching this point to raise the matter with their employer as soon as possible. This enables the employer to contact their GP – with the employee's permission – and find out how stress is affecting their work, she explains. It's far harder for the regulator to prove that stress or other health-related issues have caused someone's mistakes if they haven't already reported a problem, Ms James warns. "GPhC standards require pharmacists to promptly inform them [and] their employer if they are suffering from ill health that affects their ability to practise," Ms James says. "Nevertheless, it is common for health issues to be raised for the very first time when a pharmacist is facing GPhC proceedings." David Reissner, head of healthcare at Charles Russell, has seen what can happen when stress goes untreated. "If stress is a contributing factor, it doesn't go away unless you do something to deal with it," he says. Serious examples of stress are often a combination of work pressures with other factors. "In my experience, the [worst] stress that people are under is typically [the result of] a combination of long hours and a family bereavement," Mr Reissner says. Unfortunately this is what happens to Kate. When her mother is unexpectedly taken ill, she finds herself pulled in two directions. One day, she accidentally hands out 100mg of MST for an elderly patient who requires a prescription of 10mg. Tragically, the patient dies after taking the excessive dose and Kate is flung into the nightmare scenario that every pharmacist dreads. When she is brought before a fitness-to-practise committee, she explains the reasons for her simple error. But her explanation is not met with the sympathy she expected. It's a story that Mr Reissner has heard before. "If someone says, ‘I realise it was all too much for me and I'd made a couple of dispensing errors earlier in the week but didn't do anything to redress the balance', the regulator might not be happy with that," he explains. In the end, Kate is suspended from the register for 12 months. During that time, she reflects on the very different path her life could have taken if she had decided to seek help for stress earlier. Kate finally plucks up the courage to discuss her problems with a colleague. To her relief, the colleague reveals he has also suffered from stress in the past, like the 89 per cent of pharmacy employees who feel under workplace pressure. Suddenly Kate is able to put her problems in perspective, and realises she needs to deal with them head-on before they get any worse. Charity Pharmacist Support says taking this initial step can make all the difference. "When it comes to stress, it's important to recognise the signs," says Pharmacist Support's Ms Leicester-Hallam. "Talking to someone about how you're feeling is a great first step. That could be someone at work, a manager, colleague, a member of the HR team or your union." Like nearly 500 pharmacists and their families last year, Kate decides to phone Pharmacist Support for some free and confidential advice. "Some people prefer to speak to a person not related to the situation," says Ms Leicester-Hallam. "This could be a friend or relative, or perhaps one of our listening friends – trained volunteer pharmacists who understand the pressures of the job and provide a confidential listening ear." After discussing her situation with a Pharmacist Support volunteer, Kate decides to raise her concerns with her manager. She's surprised to find her employer was unaware she was even struggling. Together, they discuss ways to ease her workload. "Where stress is work-related, the employee should sit down with their manager to discuss what can be done to reduce the employee's stress levels," advises Sarah Booth, solicitor in employment law at Shoosmiths. "This may include reducing workloads, providing additional support or further training." Kate's employer then looks at the possible options for reducing her stress levels in the pharmacy. Ensuring the correct mix of staff is one way to ease the burden, says pharmacist Sion Llewelyn of Rowlands Pharmacy in Bala, North Wales. "I don't think companies put enough non-pharmacy staff in the shop," he says. "If you haven't got the right staff in the right place, it can affect everybody and you're spending half the time supervising new staff." Charles Russell's Ms Thomas says work rotas can also play a big part in managing stress. "Research indicates that employees with inflexible work schedules suffer significantly more than those with some flexibility," she says. "Encouraging staff to confidentially raise concerns at an early stage and removing the stigma around stress and mental health conditions all help employers manage issues before they result in significant disruption." With a more flexible rota and realistic work targets, Kate now feels more positive about coming to work and her performance improves. She is also comforted by the knowledge that she will always be able to seek help from Pharmacist Support, colleagues and her manager if she finds her stress levels rising in the future.